If at the World Junior Championship in Stockholm a special prize had been awarded for modesty and serious application to chess then, together with title of Champion, it would have gone to Anatoly. In the course of the three weeks he sat at the board calmly and in a business-like manner and pulled off one victory after another. 'Everything depends on the finish' he replied to the importunate questions of Swedish correspondents, although it was obvious that everything was virtually decided already. Eight consecutive victories in the final made his position unassailable. And it was only in the ninth round when the Hungarian Andras Adorjan, having drawn with Karpov, shook his hand and said 'Congratulations, you are the Champion' that Anatoly's face lit up in a broad grin. Many had believed in Karpov's victory. The ex-World Champion Mikhail Botvinnik, a man of high principle and guarded in his judgements, had spoken highly of Anatoly's play. And Boris Spassky, on the eve of Anatoly's departure for Stockholm, had announced 'I am convinced that Karpov will repeat my success of fourteen years ago and become the World Junior Champion'. On what was based the faith of the Soviet chess-players in the success of their representative? - an analysis of Anatoly's short but impressive sporting career. Karpov was five years old when he became acquainted with chess. He lived at the time in Zlatoust, a small town in the Urals, far from the chess centres. Anatoly soon stood out in the All-Russian Schools Championships, and at the age of eleven obtained the rank of candidate master. Quite a lot of attention was focused on the able young boy. Mikhail Botvinnik began to concern himself with him. Even then there was already an uncommonly striking tenacity and purposefulness in Karpov's play. It was strange to observe how, scarcely noticeable behind the chess pieces, the small boy sat, not stirring for five hours at a time, absorbed only by his will to win. Anatoly Karpov and Boris Spassky are surprisingly similar, and is there not a special significance in this ? When Anatoly flew into Moscow from Stockholm not one correspondent was able to extract an interview from him. It was not at all because Karpov had not yet learnt to give them, it was simply that he did not have the time. Evgeny Stepanovich Karpov, chief engineer of one of the Tula factories, drove his son, straight from the airport, back to Tula for 'repairs'. Anatoly certainly needed as much rest as possible because before him stretched a whole year of studies at the Moscow State University (MGU). And so I was chatting to Anatoly. The World Junior Champion visited the central house of culture of the Railwaymen (Moscow -eds) where the 37th USSR Championship was taking place. He looked with interest at the games played by the young débutants in the event. 'I thought' said Anatoly, 'that Volodya Tukmakov would show up best of all, but then I was mistaken'. The conversation turned to Anatoly's chess career. 'Up to the age of twelve' said Karpov, 'I had a very confused understanding of chess theory. I had read, all in all, two chess books, the titles of which I cannot now remember. 'When I was included in the junior Trud school where M. Botvinnik directed the studies, the ex-champion of the world, on becoming acquainted with my knowledge, exclaimed "he doesn't understand anything about chess". Understandably Mikhail Moiseyevich, not wanting to insult me, did not say this to my face, but I was later informed that this was the first thing he ever said about my play. 'The studies with M. Botvinnik did me a lot of good, especially the homework which he gave out. 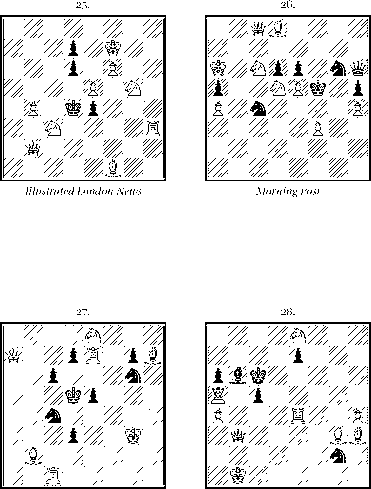 This homework taught me to work independently, forced me to sit down to work at chess books. And which chessplayers have had the greatest influence on your play? It frequently happens that parents are unhappy about the extracurricular activities of their children, fearing that these will interfere with their studies. What was the attitude of Karpov's parents to his chess? 'They had no reason to be worried' said Anatoly, 'I always got an "excellent" for my studies, and I finished school with the gold medal, and now I am taking the first course of the Economics Faculty of the MGU.' Well, what are your interests apart from chess? 'I like pop music, Lermontov and I collect stamps.' Anatoly looked searchingly at me, expecting some further questions, but I well realized that he had long been wanting to go to the tournament hall where it was much more interesting.